If we come across unknown file types in Windows ,normally we get a message box asking us to specify a program to open that particular file . Sometimes we will be forced to search internet for finding out a suitable program .So here is a Windows software that can identify file types and provide direct web link to softwares that can open them . Openwith.org , the creators of this software , has a collection of thousands of file extensions in their database . 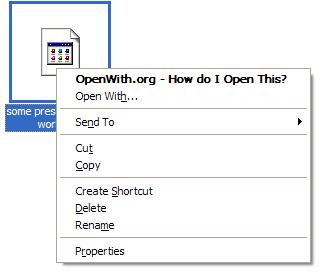 Openwith.org software adds another option to your context menu .So when there is an unknown file type , right on the file . And now select “How do I Open this “. Then the software will display few suitable programs that can open this file and provide direct download links . Here the unknown file is Power Point Show . 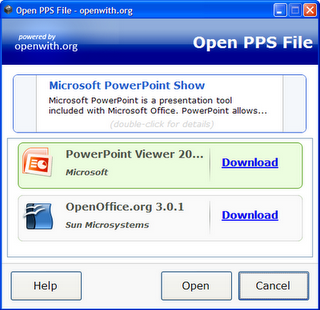 So here they provide two options , Openoffice and PowerPoint viewer . Connect to internet and click on download . And as shown above , the software will be downloaded and could be used to open pps/target file . Download Openwith.org to know about unknown Windows file types and to download a suitable solution to open them.